Posted on March 18, 2013 by chrismparsons. Bookmark the permalink. 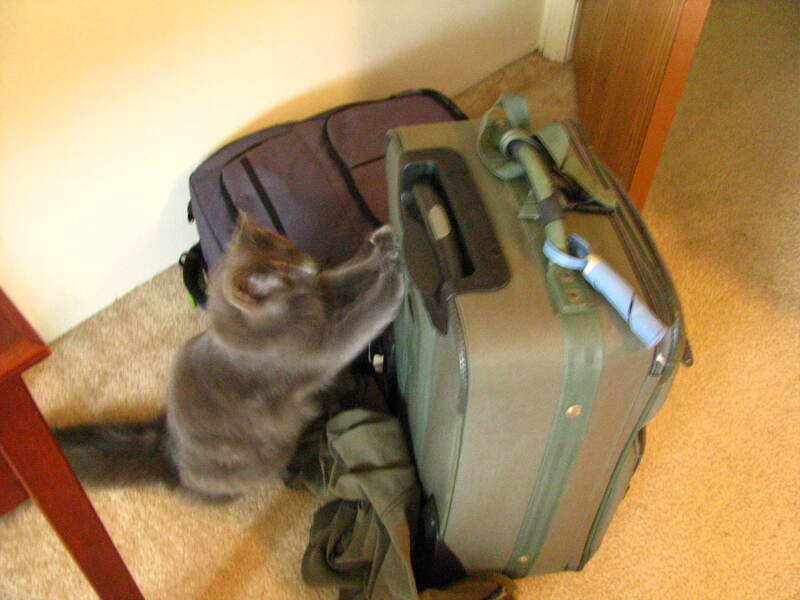 I love the cat picture and the metaphor of an unpacked suitcase! I’m also interested in the ways new platforms “genrify” ( I just made up that word, there’s probably a better one.) and how these (new?) genres support/fail to support effective communication. I think there is a lot of excitement about making them cross over, but I’m not sure it always works. So what do we learn from the “interesting mess”? As to Twitter’s uses . . . As a person who doesn’t use Twitter, I guess I’ll throw out a question: I know people are using Twitter as a professional networking tool (people at C’s were doing this all the time). Does that change how you use it? What are the characteristics of a professional – Tweet genre? I don’t know that this is a question for you, Chris — but I think it kind of relates to what you’re saying about the (unhappy?) mixing of genres above. Your three reasons for why the session on heuristics for solving writing problems was a “mess” are interesting – I’m most convinced that the last reason probably mucked up things most. You are right that trying to fit what started in a edited collection into a 4 minute pres accompanied by a tweet seems insane. As for your other reasons, technical writers should know that their audience isn’t going to be just other tech writers, so perhaps they should know to make their points understandable for a more general writing audience. And the 4 mins., well, make one point only and quickly. I don’t think the problem with reading a paper to the audience was confined here only – people did this in other sessions with 20 mins. It’s sad to me that they had such wonderful speakers but that they were limited in so many ways by the required format of the panel. These “roundtable in tweets” sessions are a bit in vogue – but maybe the tweets are best left where they are supposed to be, on Twitter. Your comment on wearing the “First-Time Attendee” tag all week also makes me think about the reasons that they do that. Maybe they want to make first timers feel welcomed and give some sort of conversation starter to people who see your tag? But for me it would probably make me feel more conspicuous and that I didn’t belong. I can’t even remember if I had a tag last year when it was my first time – I think I forgot to check the box or something. I’ll be interested to hear how you reacted to it. The tag is optional! The yellow ribbon has a sticky back that fits on the badge. I decided to do it because: a) I really am very down for guidance; b) There was some rumor of free drinks. Yeah — definitely feel free to mention it! As for standing out, James Porter had an acronym (Product, Process, Ethos, Scene, Effect) that provided some focus. Maybe a helpful device for the length of time. I love the insertion of some critique in your reaction to these panels, and the questions you brought up in response to assumptions both ableist and design-oriented. It seems like there is a panel in here for you to be presenting! I particularly like the critique of the Roundtable model. These kinds of presentations seem to be quite the rage right now, where a group will have one photograph/slide and 2-4 minutes to create a work of meaning or outline a project from it. For some disciplines this quickness works well–the photographic and artistic seem to benefit from some exercise in brevity–but for others it is an attempt to map a trend to a landscape which calls for a globe. While these technical disciplines might really benefit from being called upon the write in a more popular or accessible style, and to begin to explain themselves to a wider audience (one that, indirectly, ends up funding much of their discipline and would be a good ally if reached out to). Side note 2: Any post with a cat in it doing something adorable gets an automatic five star rating. 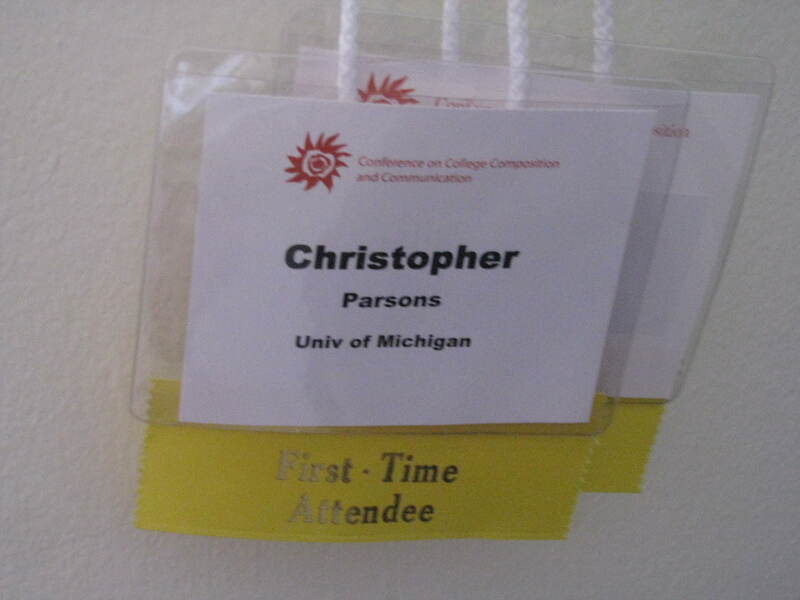 Since this was your first time to CCCC (I’ve never been), I wonder how the conference either surprised or met your expectations, and what advice (beyond that interesting one of rating the sessions re: prior knowledge) you might give to a first-time attendee now that your are a C-soned conference goer! PS. I now have not one, but two (two!) unpacked suitcases in my living room… I hadn’t quite gotten around to unpacking from spring break before leaving on Wednesday morning. Ugh.